Loss of Eoghan and Ruairí will be felt long into the future says parish priest. They gathered in great sadness to recall two much loved brothers and to acknowledge the deep wounds of grief carried by the Chada family and the local community. 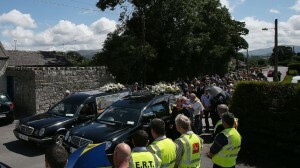 Speaking as he began Requiem Mass for Eoghan and Ruairí Chada in Ballinkillen, Co Carlow, Fr Declan Foley said the deaths had “stunned” the whole community. The two much loved little brothers were taken in white coffins from their home to St Lazerian’s church where their grandmother is a sacristan. Kildare & Leighlin Bishop-elect, Fr Denis Nulty, concelebrated the Mass with parish priest, Fr Foley. He said that he wanted to remember the joy and energy and life they brought to their families, their school, Ballinkillen and Fenagh GAA Clubs, Nurney Soccer Club and the local community. The community of Ballinkillen, Fr Foley underlined, had suffered a loss that would be felt long into the future. Citing the Gospel words of Jesus as he died, ‘My God, My God, why have you deserted me’, Fr Foley said these words took on a whole new meaning for the family on Monday afternoon when confirmation came through from Westport of the deaths of Eoghan and Ruairí. In their short few years, they achieved so much, lived with such energy and intensity, brought such joy and happiness to their Mam and Dad, and Ballinkillen community – and the parish priest said all that needed to be celebrated. “We have all become familiar in recent days with the lovely photograph of the two boys, portraying a beautiful image of closeness and love. This picture manifests perfectly their relationship. This gives us a picture of two little boys who lived life to the full and who embraced every day with energy and were full of love and happiness,” he said. Symbols of the boys’ lives and interests were presented during the procession of symbols, including a hurley and ball, a toy tractor, a cookbook, a golf club, a bicycle and a photograph of the boys. A guard of honour was provided by Eoghan and Ruairí’s team mates from the local hurling, football and soccer clubs. The two brothers were laid to rest in the cemetery adjoining Saint Lazerian’s church.